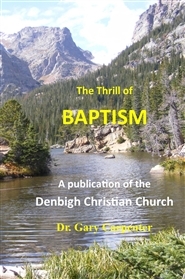 The Thrill of Baptism was prepared for the Denbigh Christian Church. However, it can be customized for use with your church's name by first contacting Word Alive Enterprises at wordaliveenterprises@gmail.com. 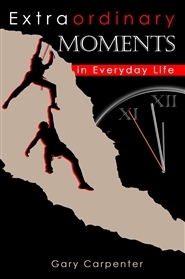 Once we custom design your book, we will send instructions on how to purchase it through TheBookPatch. The Thrill of Baptism is a strictly biblical presentation of the New Testament teaching about baptism. Its unique feature is that it is larger than a tract which contains insufficient information, but smaller than a large book most do not want to plow through. 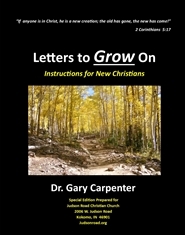 At under 40 pages it is a quick read which answers the vast majority of questions related to Bible baptism. The Holy Spirit has revealed himself to us. 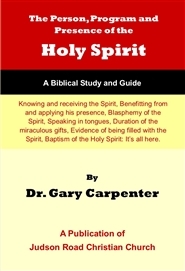 In this biblical guide, we examine how to know and receive the Spirit, the benefit of applying his presence in life, what the blasphemy of the Holy Spirit consists of, understanding the duration of Spiritual gifts with a special look at speaking in tongues, the baptism of the Spirit, and the evidence of being filled with the Spirit. It's all here in a clear, brief, accessible study of the scriptural information. The Thrill of Baptism is a strictly biblical presentation of the New Testament teaching about baptism. Its unique feature is that it is larger than a tract which contains insufficient information, but smaller than a large book most do not want to plow through. 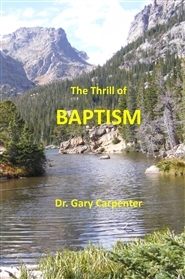 At under 40 pages it is a quick read which answers the vast majority of questions related to Bible baptism. This edition is generic and can be used by any church, but upon request The Thrill of Baptism can be customized with your church's name on the cover and throughout by first contacting www.wordaliveenterprises@gmail.com.